This map contains inaccuracies. Locations are approximated. Therefore, it should not be used for navigation or solely relied upon for planning. Always have a good map and compass with you (not just a GPS as electronics can and do fail) and know how to use them. This web page does not perform well with Internet Explorer 8 and below. For best results, install Chrome Frame or use Internet Explorer 9+, Firefox, Chrome, or Safari. If the map does not load, try refreshing the page. If the map changes in any way after displaying this link, you must press "Update Links" above to refresh the link before copying it. Warning: Do not select the Affiliate ID option if you will be posting the link on a website that does not allow commercial posting. Please visit the downloads page for a list of KMZ and GPX files that you can use. The following information was kindly provided by J. Archer Harris from his website Paddler's Campsite Database (PCD) for Quetico Park. The RouteFinder is for entertainment purposes only and should not be relied on for trip planning or navigation. To delete any routes, go to your Saved Routes page in your account. Because either you have it selected in the settings or the normal method took too long to calculate, this route was calculated using the bidirectional method. This method calculates much more quickly than the normal method, but it may not choose the optimal route. Please check the route to make sure it makes sense. The times and distances are accurate for the route presented. The Route Finder Area calculation is similar to the Route Finder but in reverse. The Route Finder calculates the distance and time from one point to another. The Route Finder Area calculation finds the points you can reach within a certain time or distance. The calculation is performed using the first point on the route points list and the settings below. In addition to the regular Route Finder settings, these settings affect the route finder area calculation. There was an error with the Route Finder Area calculation. 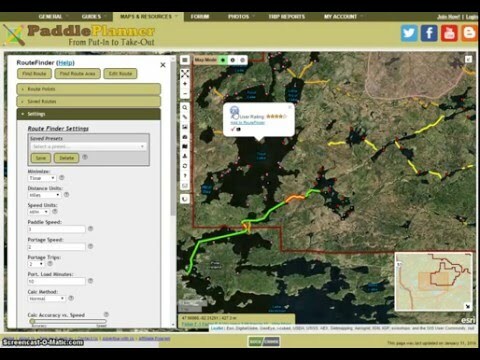 The route "movie" will show a little canoe going along your calculated route and popup photos along the way. This is still something we are experimenting with, but it was so much fun (and strangely addicting) that we thought we'd share what we have so far. Since it is still in development, it does not work perfectly. We know some of the problems, but please let us know if something doesn't work right or if you have suggestions to make it better. When this is final, it will probably be for the paid memberships. During the development stage, though, anybody can use it. Turn the background and markers on or off that you want showing in the "movie" by using the map options in the upper left corner. If you don't have a mouse wheel that can be used to adjust the zoom, change the zoom level to what you want before beginning the movie (all toolbars will be hidden). You don't need to worry about centering since that will be done automatically. It will take a little while for the controls to show up. Once the photos are loaded, a control bar will appear at the bottom of the screen. Press the play button. You can adjust the speed using the speed dial near the bottom of the screen. The default is 60x - for every second the movie runs, the canoe moves 60 seconds along the route. When finished, press the X in the lower right corner. For now, if you want to rerun the movie with the photos, you'll have to exit out and start the movie again. We're working on making that process better. Please use this form to report any errors or inconsistencies in the RouteFinder. Please report any unexpected results, calculation errors, and anything that seems to be wrong. The last route you tried to calculate will be included automatically in the report. You can use the box to comment on the results/errors you found. If you want a reply and are not signed in, please include your email address. This is a "Map Enthusiast" feature. Upgrade now! Multiple destinations in the RouteFinder is a "Map Enthusiast" feature. Upgrade now! Upgrade now to increase the tool limits! No route has been calculated. First calculate a route before saving. To manage your saved routes, go to your Saved Routes page in your account.